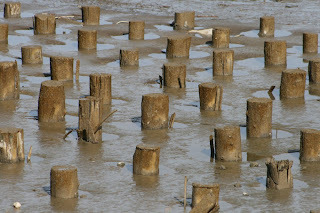 Theses are pilings that surround the concrete footings of the No. 2 Road Bridge, which crosses the Fraser River and connects Lulu Island to Sea Island. The tide was very low today; I don't often see the pilings. I assume they are there to stabilize the muck. Guess it has gone the way of the Dodos and other dead things, as in your earlier post. Sorry to hear about all the equipment failure. It seems laptops are so much more prone to that - desktops are boring and unhip but it's hard to argue with $300 or thereabouts for a fully souped up machine. Our old PC (5 yrs) is on its last legs too, any minute now... instead of littering the mudflats, could you go nuts on the laptop with a hockey stick a la the printer scene in "Office Space"? You could gather the bits to take to the computer recycling center afterwards. Might be immensely satisfying! Is that Richmond's version of Fingal's Cave? I'd donate $10 to see a vid of you taking a twig to your Slimeline for sure. Me, I switched to Mac and am pleased as punch with it. Their machines are simple and smart - it's almost as if they're designed for humans. Spiny, Or perhaps the Giant's Causeway. RT: Like Basil Fawlty beating his car with a tree (one of the funniest scenes ever)? Yes, it felt like that. Maybe I should consider a Mac. Those two issues though--$$ and inertia. That Fawlty Towers scene is the perfect example. The aforementioned scene from Office Space is also a classic. How much is your time worth? I spend far, far less time dealing with my Macs than my PCs. Virtually none in fact. And I actually find delight in them. Weird. The 100 watts a Mac only uses, and the amazing power saving, sleep and wake up features they have that just always work have gotta save money over fussy PCs. Office for Mac is quite good. And, if you have an Apple Store nearby, the above is amplified because their Genus Bar is pure genius. You sign up for an appoint online, walk in, and smart people listen to you and help you - for free. My battery died on my macbook after about a year - they replaced it on the spot - for free. Thanks for that. Certainly something to consider. I'll look into it.